The Scottish Seabird Centre offers the chance to see wildlife in its natural habitat. This is live activity that visitors to the Discovery Centre are controlling. The images above refresh every 5 seconds and are transmitted live from our solar powered cameras. The island of Fidra is an RSPB reserve and believed to be the inspiration for Robert Louis Stevenson's Treasure Island. This small island is about three miles from the Scottish Seabird Centre and with grassy slopes and cliffs, it is home to small populations of guillemots, razorbills, gulls and puffins. During spring there are fantastic views of nesting fulmars. 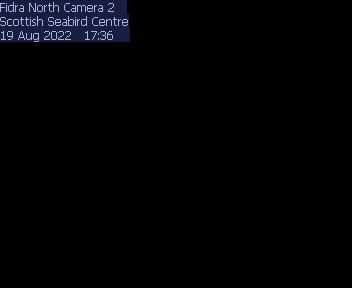 If like what you see, why not visit the Discovery Centre and control the cameras for yourself. You can extend your Seabird experience with a seasonal boat trip. If you take any nice photos of Fidra share them with us on Facebook, Twitter or Instagram with #Fidra #SeabirdCentre #seabirddays.